The Osthoff Resort is an award-winning resort set on the shores of Elkhart Lake that offers comfortable accommodations, first-class amenities, and facilities and gracious hospitality. 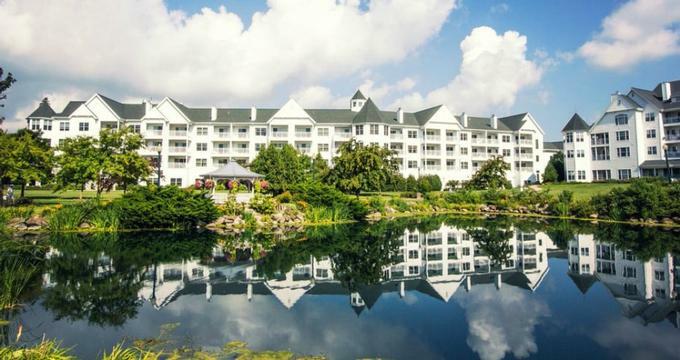 The AAA Four Diamond hotel is set on a 500-foot private sandy beach and features deluxe lodgings in the form of guest rooms and suites, four dining areas including a fine dining restaurant with an elegant lounge and the off-site Elkhart Inn with a lake deck with live music. There is a world-class spa, indoor and outdoor swimming pools, saunas, whirlpools and a fully equipped fitness center, as well as the L'ecole de la Maison cooking school, an arcade and games room, tennis courts, and a variety of activities to enjoy. The resort also features modern spaces for events and functions and offers an array of summer and holiday activities program for children. The Osthoff Resort is a few miles from Henschel’s Indian Museum and the Road America racetrack. The Osthoff Resort features deluxe lodgings in the form of beautifully appointed guest rooms and suites with contemporary décor and modern furnishings. Guest Rooms are simply designed and furnished with king-size beds dressed in deluxe linens and comforters and plush pillows, en-suite bathrooms with walk-in showers, two-person whirlpool tubs, thick towels and branded bath products, and wet bars with mini-fridges, microwaves, and coffeemakers. Guest suites range from one-, two-, and three-bedroom suites with different views and feature bedrooms with king or queen-size beds in deluxe linens, comforters, and plush pillows, and en-suite bathrooms with separate walk-in showers and two-person whirlpool baths, fresh towels, and branded bath products. Spacious living rooms have comfortable sofas and armchairs, gas fireplaces, and queen-size sleeper sofas for additional guests, along with flat-screen televisions with cable channels, DVD players, and gaming services. Dining rooms have table and chairs for up to six guests, and fully equipped kitchens or kitchenettes have microwaves, toasters, coffeemakers, dishwashers, fridges, stoves or stovetops and dishware, utensils and cookware. Suites have private balconies with breathtaking views, and modern en-suite amenities include hairdryers, irons and ironing boards, alarm clock/radios, portable cribs and highchairs (on request), and complimentary high-speed wireless Internet. Two-bedroom premier suites and three-bedroom suites include in-room washers and dryers, and additional guest services include an evening turndown service on request, laundry facilities on each floor and same-day dry cleaning available from Monday through Friday. The Osthoff Resort provides several dining options with a focus on creative regional cuisine served in casual and relaxing environments with breathtaking views. Lola's boasts elegant décor and beautiful views and serves fresh regional cuisine, accompanied by an outstanding wine list, while Otto's Restaurant offers a creative menu of all-American cuisine in a laid-back atmosphere. The Elkhart Inn is rich in history and tradition and provides a menu of classic dishes prepared from locally grown ingredients, and The Elk Room at The Osthoff Resort boasts floor-to-ceiling windows with spectacular views, a cozy fireplace and comfortable lounge seating – an ideal spot for casual drinks. The Osthoff Lake Deck serves traditional food, refreshments, and specialty drinks accompanied by live weekend entertainment during the summer season on the private beachfront, and guests can enjoy seasonal poolside dining Memorial Day through Labor Day. The Osthoff Resort also offers a room service menu, banquets and buffets, and special dining events. The Osthoff Resort offers an array of world-class amenities, facilities, and guest services, including the exclusive Aspira Spa, a fully equipped fitness center, two outdoor swimming pools, and an indoor swimming pool and two large whirlpools. Outdoor sports are available seasonally and include tennis, basketball, and volleyball, with courts open during the summer months, while the resort’s 500-foot lakefront private beach offers a variety of activities ranging from bike rentals and watersports, a children’s playground, and a sandy beach. The L'ecole de la Maison cooking school offers cooking classes throughout the year, there is a games room and arcade houses a full-size pool table, air hockey, a jukebox and arcade-style video games, and a variety of family-friendly activities are available for the whole family in the Pleasures Program. The Osthoff Gift Shoppe and Aspira Spa Boutique sell a selection of clothing, giftware, health and wellness products and souvenirs, and the Osthoff In-Bloom in-house floral department provides stunning floral arrangements for special occasions. Overlooking Elkhart Lake, the Osthoff Resort provides a selection of beautiful venues for special celebrations and occasions, business meetings, and corporate functions. The resort has numerous locations for romantic ceremonies, including next to the lake, beneath the gazebo or a tent on the lawns, or various meeting rooms. Guest services include catering services, from sumptuous buffets to delicious sit-down dinners, professional wedding planning and event management, access to the world-class amenities of the resort and luxurious overnight accommodations. The Osthoff Resort also hosts a variety of special events throughout the year, including the Big Band Gala, the Harvest Moon Ball, Jazz on the Vine, and the Old World Christmas Market.